I watched this film on TV only during my childhood. It impressed me very much because of the subject : “the French participation in the American War of Independence” (1775 – 1783). Also, to-date, it is the only movie about the General Marquis de La Fayette who was one of the great figure of the American and French History of the period. That’s why it is a very special movie to me. 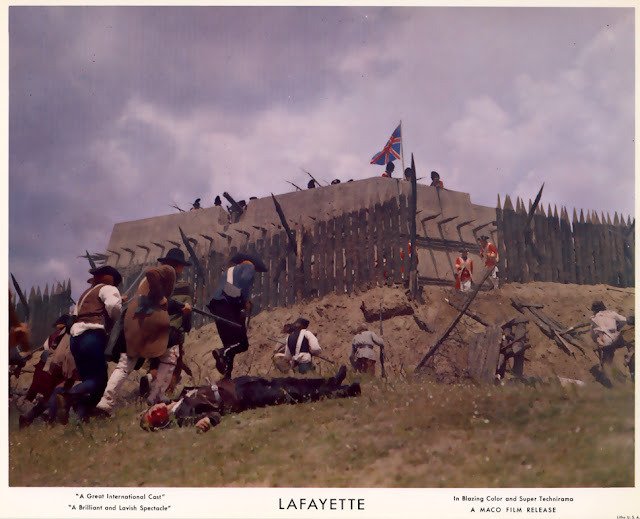 The Story : “ In 1777, the Marquis de La Fayette (portrayed by Michel Le Royer) joins the American insurgents in their fight for liberty against England. 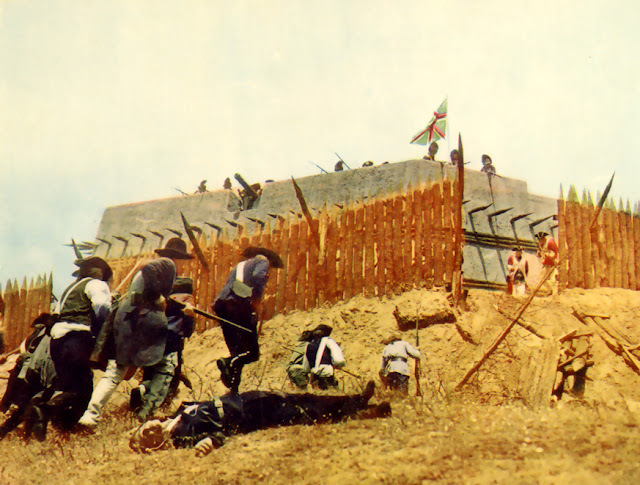 He freighted a ship to America with a handful of friends and some weapons. 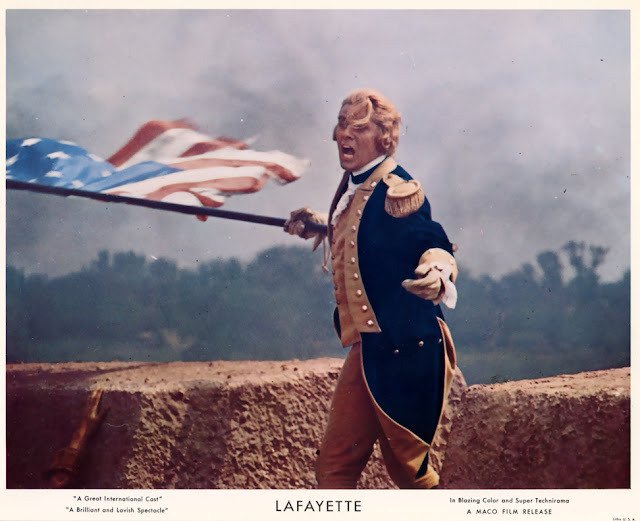 When he arrives in Philadelphia in face of the American Congress, he explains that he comes to America, at his great personal expense and sacrifice, only to fight for freedom. He adds that he renounces any military rank. But Congress realizes his sincerity and unanimous accepts him as a Major General. Soon, he becomes George Washington's best friend. 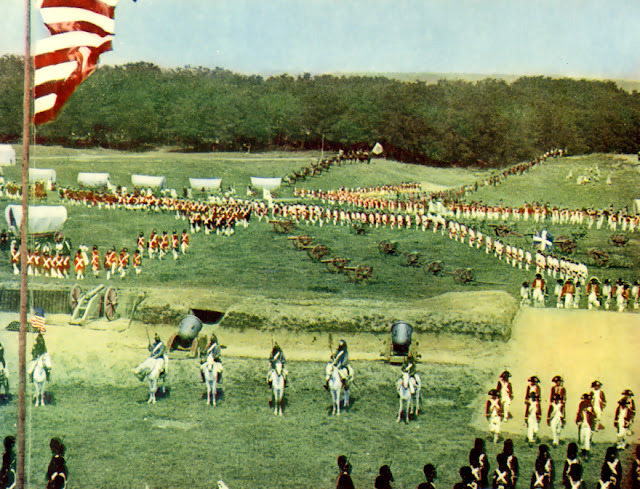 They fight together at the Battle of Yorktown in which Washington (Howard St-John) gets the surrender of the English General, Cornwallis (Jack Hawkins)” with the help of an Army of French soldiers (under the command of the Lieutenant General Comte de Rochambeau) and the French Navy (headed by Admiral De Grasse). In 1960, the French Versatile movie director Jean Dréville (“Normandie - Niémen » (1960)), was called by the French high class actress-Writer-producer Suzy Prim (aka Suzanne Arduini) and by the veteran producer-Distributor Maurice Jacquin (“Cold Sweat” / “De la part des Copains” (1971), “Mayerling” (1968)…) to direct « Lafayette ». Jean Dréville was one of the most very prolific French director of the 50’s. A lot of his movies became French remakes later on. 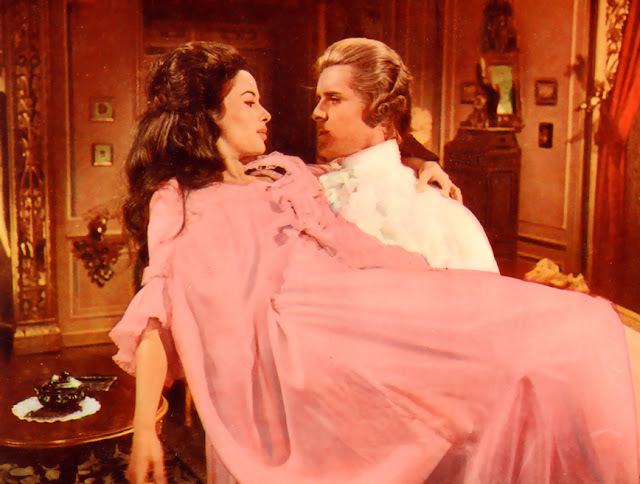 The first was a very fine version of Alexandre Dumas’ Queen Margot (“La Reine Margot”/1954) with the legendary actress Jeanne Moreau in the title role. In 1996, Patrice Chéreau directed a new version with the gorgeous Isabelle Adjani. “Les Choristes” (2003) directed by Christophe Barratier with Gérard Jugnot was a remake of “La Cage aux Rossignols” with Noël-Noël. In 1948, Jean Dréville directed “La Bataille de l’eau lourde” with the help of the actual Norwegian resistance fighters who prevented the Germans from securing a key ingredient needed for their atomic research during WW II : “Heavy Water”. In 1965, the American director, Anthony Mann (“El Cid”/ 1962) directed a remake of this movie with Kirk Douglas and Richard Harris, under the title of “The Heroes of Telemark”. But for “La Fayette”, Dréville believed so much in the making of this epic historical drama that he decided to become a co-producer with another French talented director-producer Jean Devaivre (“Alerte au Sud” / 1953). Dréville directed the movie during seven months (from February to August 1961) in Serbia and in France. 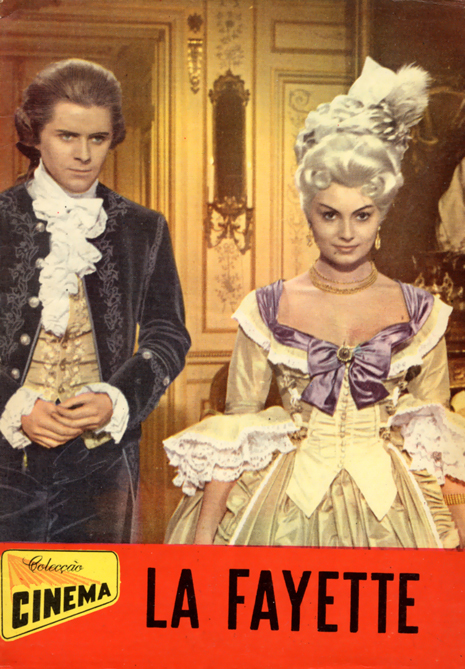 The producers (Copernic-Cosmic Production) of “La Fayette” gathered an international cast : “Howard Saint-John (as George Washington), Vittorio De Sica (as Aaron Bancroft), Rosanna Schiaffino (as countessa de Simiane), Edmund Purdom (as Silas Deane), Folco Lulli (as captain Rocco Borsalino), Jacques Castelot (as Duc d’Ayen), Pascale Audret (as Adrienne de La Fayette), Wolfgang Preiss (as Baron Kald), George Rivière (as Vergennes), Liselotte Pulver (Queen Marie-Antoinette), Albert Rémy (as Louis XVI), Renée Saint-Cyr (as the Duchesse d’Ayen), Henri Tisot (as Comte de Provence)...”. 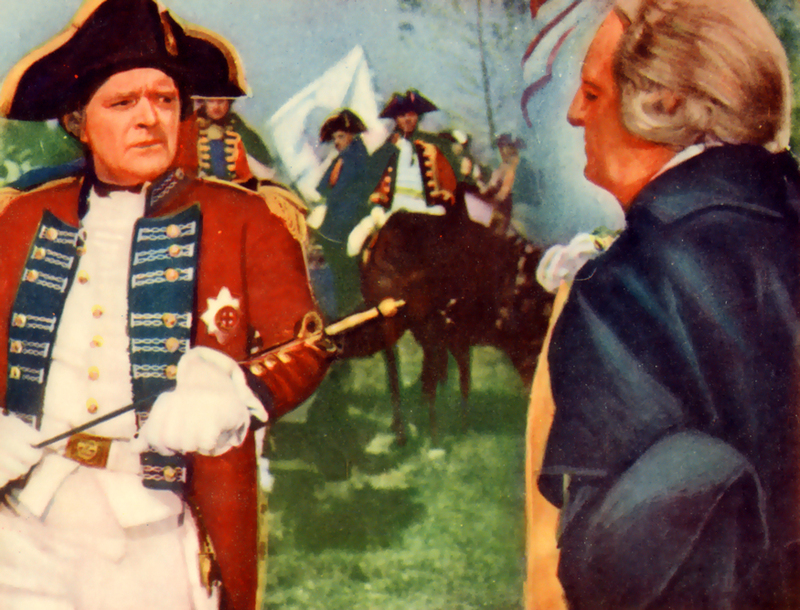 To complete the casting, the distinguished British actor Jack Hawkins (“Ben-Hur” (William Wyler / 1959), “Lawrence of Arabia” (David Lean / 1962)) portrayed a very witty General Cornwallis. 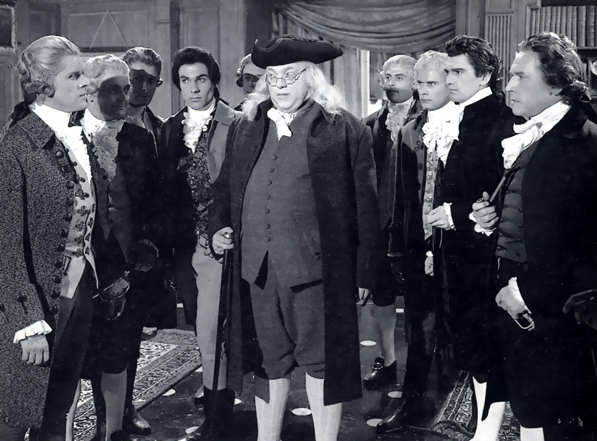 For the second time, the legendary Actor-Director Orson Welles (“Citizen Kane” (1941)) played the impressive part of Benjamin Franklin for a French Production (“Si Versailles m’était conté” directed by Sacha Guitry / 1953). 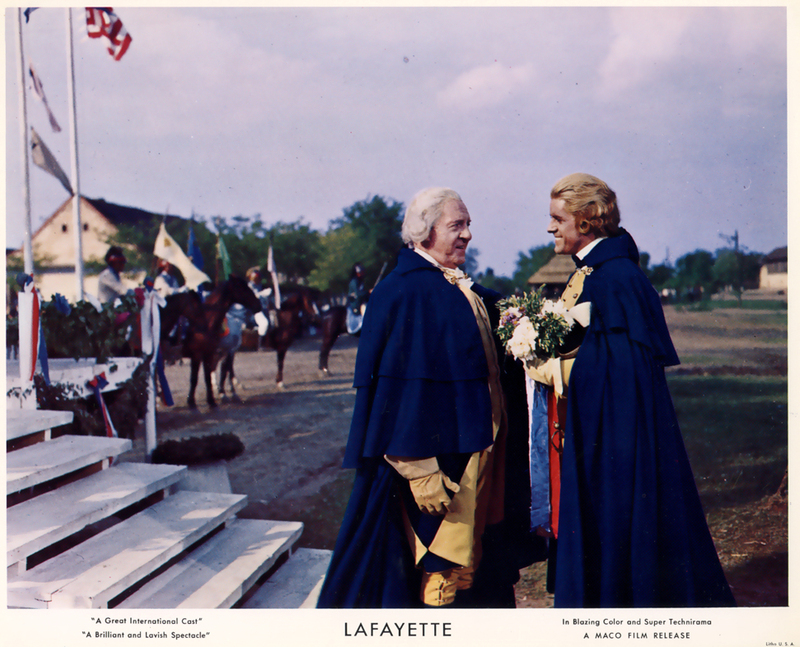 To portray the leading role of the Marquis de La Fayette, the talented Jaques Charrier (“Les Tricheurs” (Marcel Carné / 1958)) was the first choice but eventually the young actor of the French theater (“La Comédie Française”), Michel Le Royer, got the leading part. Le Royer was best known as one of the greatest star of several popular historic French TV series like “Alexandre Dumas’ Le Chevalier de Maison-Rouge” (Claude Barma / 1963) and “Corsaires et Flibustiers” (Claude Barma / 1966). In passing, people may be interested in hearing that in 1971, Le Royer portrayed for the second time the character of La Fayette in “Le Voyageur des Siècles”, a TV sci-fi mini-series written by Noël-Noël, still under the direction of Jean Dréville. 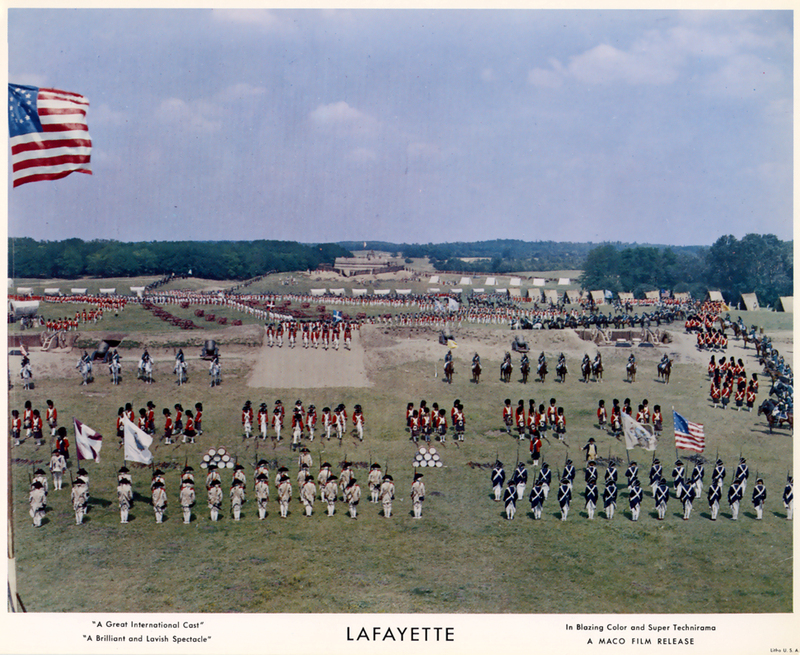 The third chapter (“Le grain de sable”), took place many years after the American war of Independence. 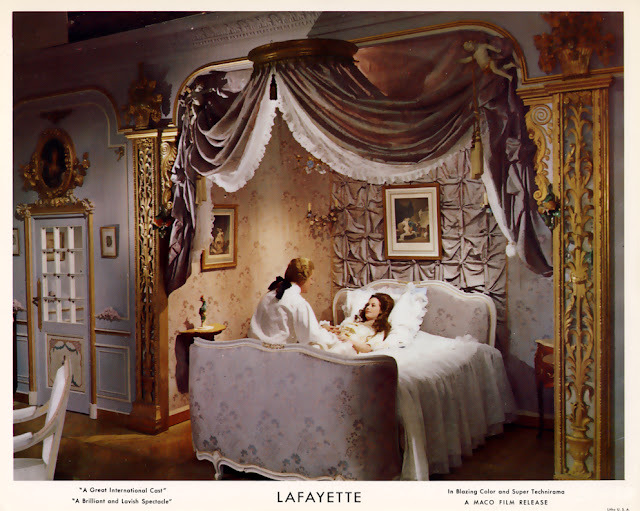 La Fayette remembered about the glorious days of his youth with two French scientists who travel through the time with the aim to change the course of the History and the French Revolution. 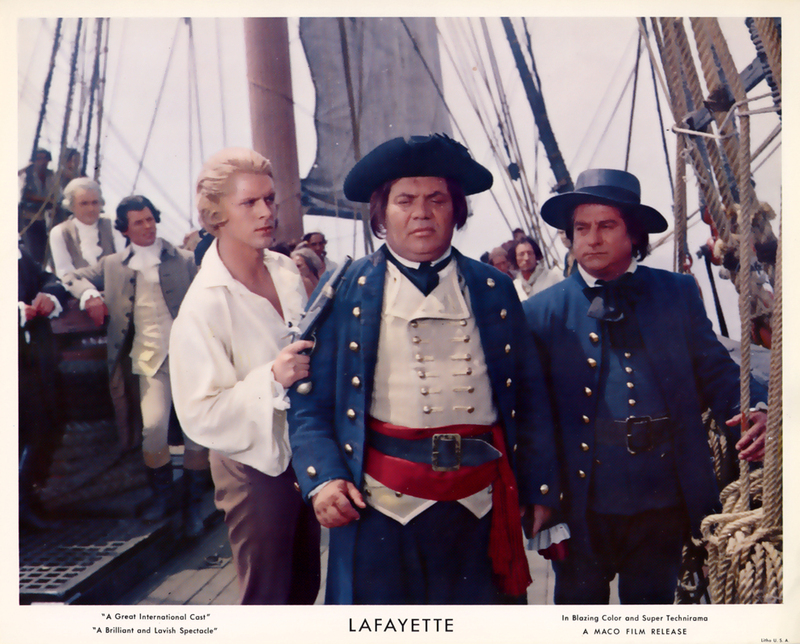 But as to “La Fayette”, the producer Maurice Jacquin succeeded in gathering a colossal budget (some rumors said around one billion of Francs !) It was the most important French movie ever produced at that time without the cooperation of an American Film Major Cie. 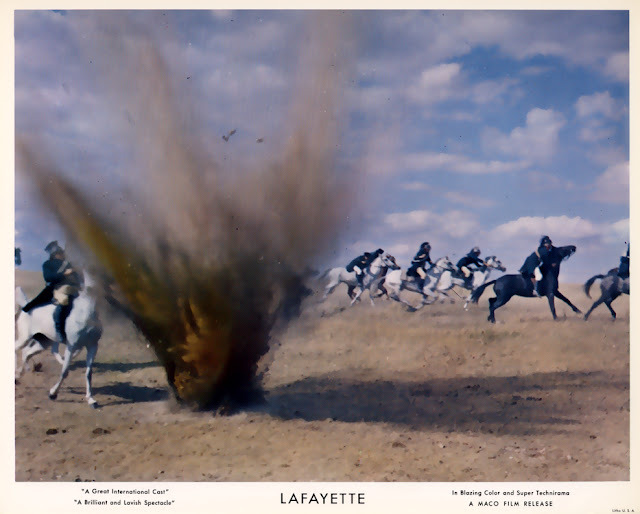 The other credits included two great cinematographers Claude Renoir (“Barbarella” (Roger Vadim / 1968), “The Horsemen” (John Frankenheimer / 1971), “The Spy who Loved Me” (Lewis Gilbert / 1977)), Roger Hubert (“Les Enfants du Paradis” (Marcel Carné 1945), “Queen Margot / La Reine Margot” (Jean Dréville / 1954), « Bonaparte et la Révolution » (Abel Gance / 1971)) and the art director Maurice Colasson (“La Maison du Maltais” (Pierre Chenal / 1938), “Queen Margot / La Reine Margot” (Jean Dréville / 1954). 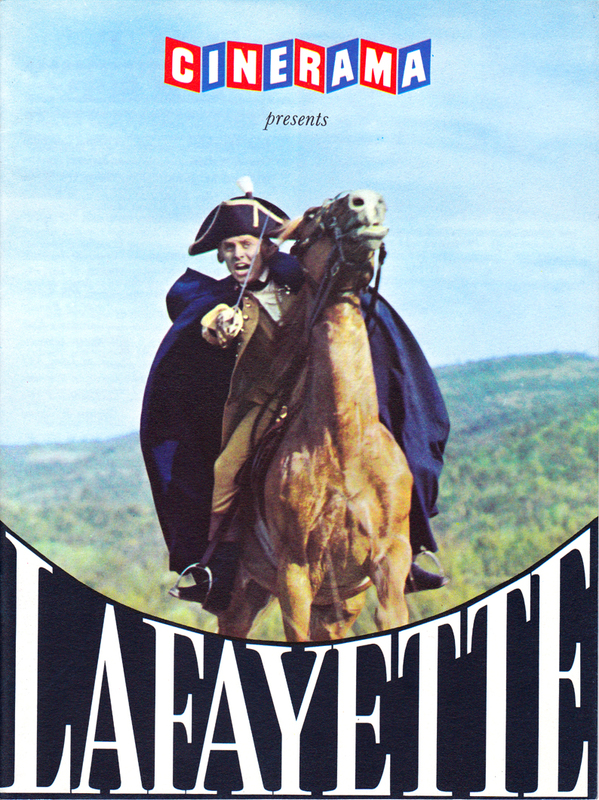 “La Fayette”, a great Movie for a great historic Figure. 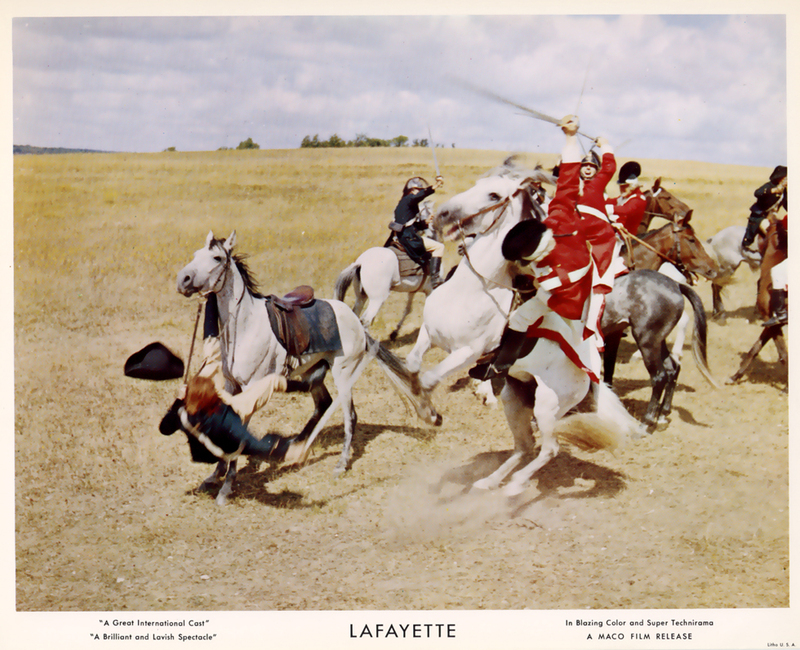 The movie was photographed in Super Technirama 70 (Technicolor and Stereophonic Sound 6 tracks) at the Victorine / Nice Studios and at the Chateau de Versailles, France. The Battle of Yorktown was shot at the Avala Studios, Belgrade, Serbia with more than 5000 extras ! Jack Hawkins, Orson Welles and all the rest of a fine cast gave a very convincing performance. 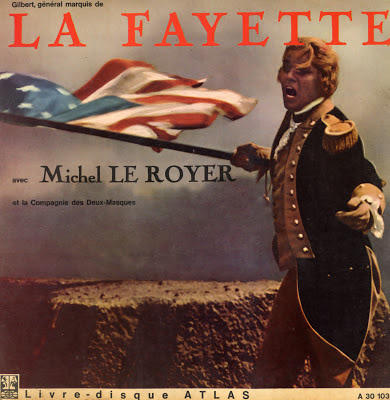 Also, it must be noted that for his first great international appearance on the big screen, Michel Le Royer was a spirited Marquis de La Fayette who was really involved in all the generous ideas of the American Revolution. His intimate scenes with Jack Hawkins and Howard St-John were very good. The film received very good reviews from the European audience and the critics. It took the 5th rank just after “The Guns of Navarone” (Jack Lee Thompson) at the French Box office. 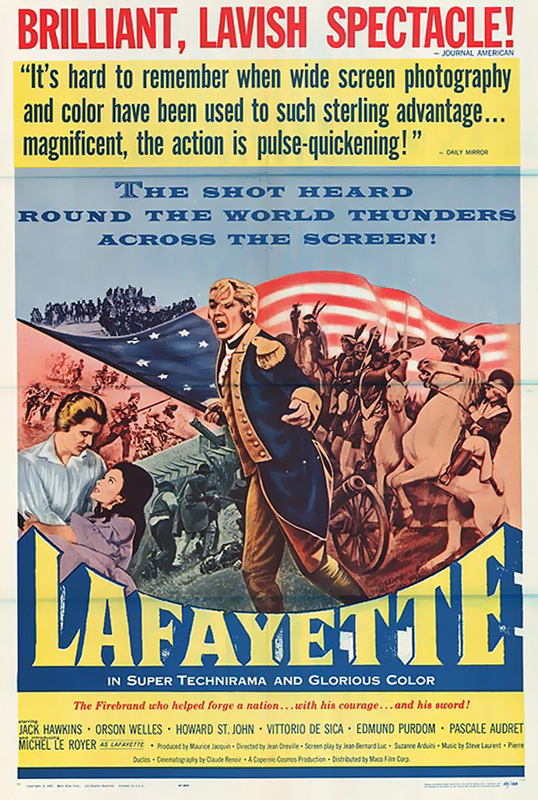 In 1963, “La Fayette” was distributed by CINERAMA in the United States where the movie received a polite response because of Jacquin’s reluctance in having any American Studio involved in the production. 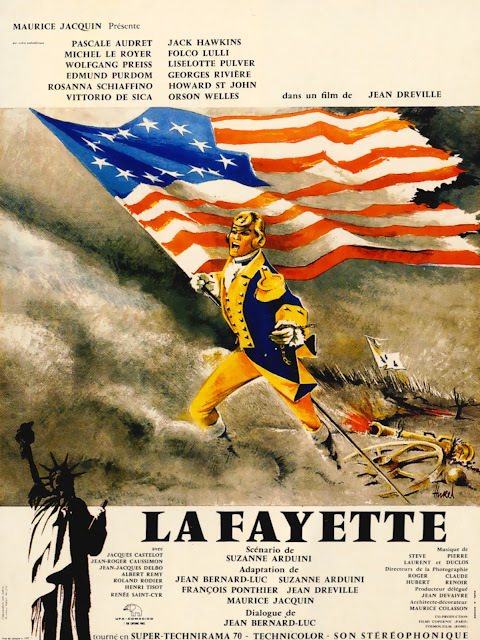 Nevertheless, “La Fayette” is a very fine entertainment and remains one of the rare movie which reminds of how important was the French help in the fight of Americans in getting their independence. 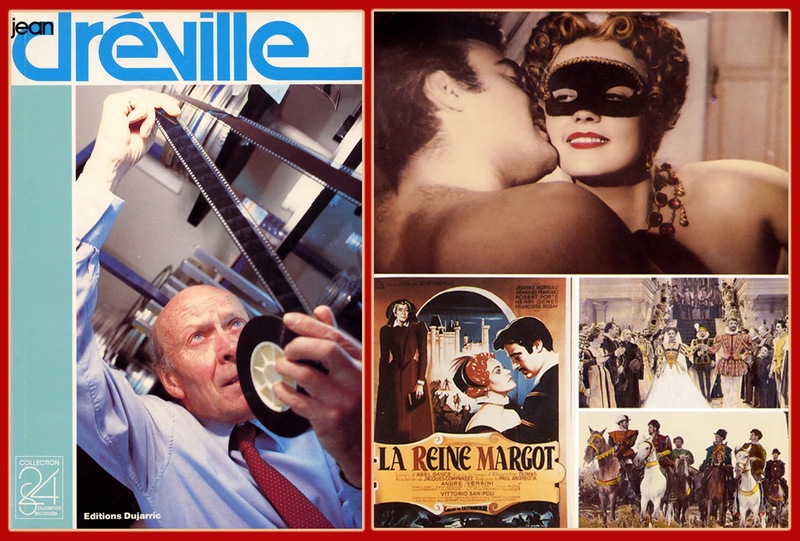 It is a good reason not to forget and to rediscover the Jean Dréville’s audacious movie. 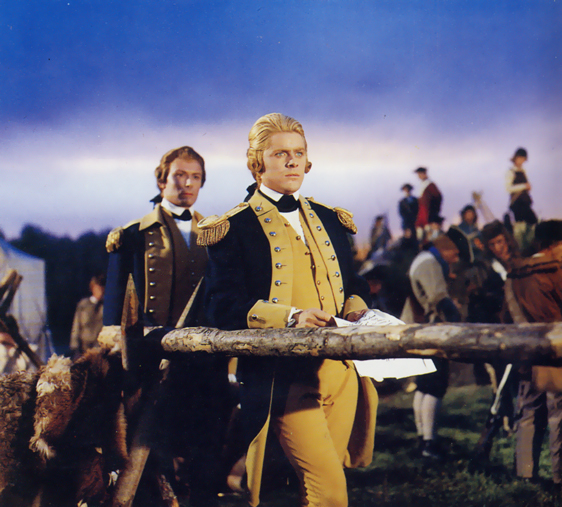 In 1988, Jean Dréville wanted to restore the movie for the Bicentenary of the French Revolution, but the original negative was lost. So he asked for the help of the American distributors to find old copies in the aim to recreate a new negative. Fortunately, with a lot of patience and efforts, he succeeded in the restoration of the movie that got the same quality of perfection as at the time of the premiere at the Opera of Paris in 1962. It was showed at the first French “CinéMémoire Festival” of Paris in 1991. A new movie on La Fayette ? 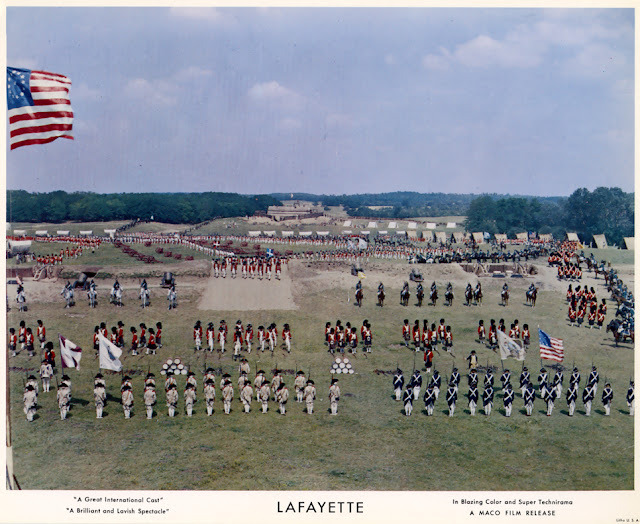 “La Fayette” by Jean Dréville, the US Souvenir Book (In English), 1963, Cinerama, US. (This book includes movie production information, actors' and actresses' biographies, as well as, synopsis information about the movie…). “La Fayette” by Jean Dréville, the Portuguese Souvenir Book, 1961, Colecçào Cinema, Portugual. “Jean Dréville” by Claude Guiguet, Emmanuel Papillon et Jacques Pinturault (in French), Collection 24 Souvenirs/Seconde, Edition Dujarric, Paris, 1987, France. 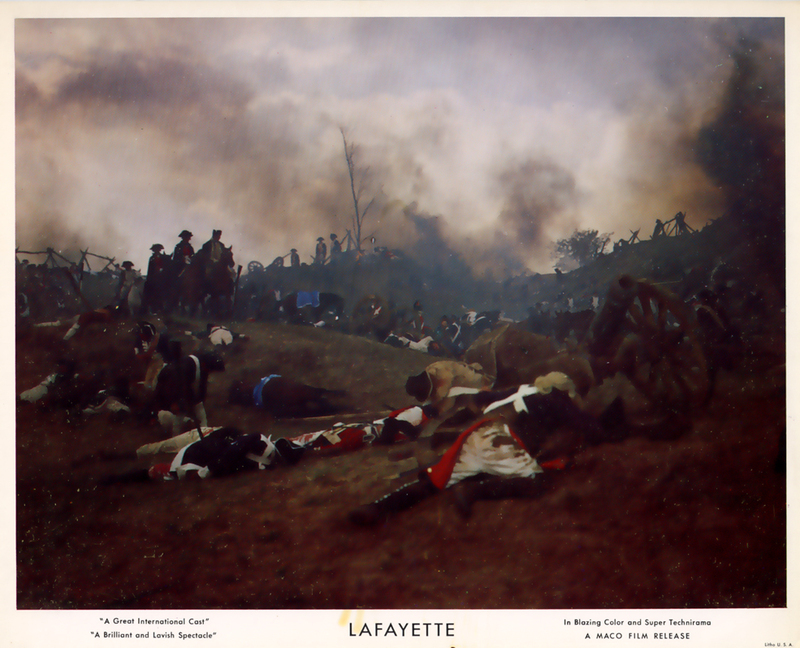 “La Fayette” by Jean Dréville (in French), 1997, Canal + Vidéo, VHS - Secam, Ref : 27276, Color, Cinemascope, Mono (2 h 12). 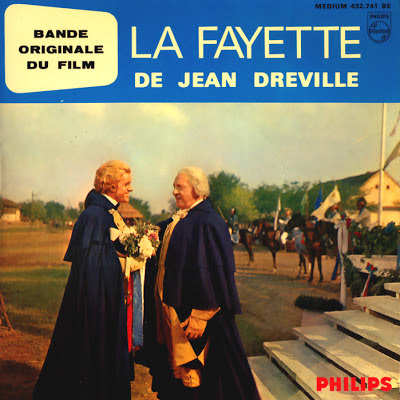 EP / 45 T - Original Soundtrack from « La Fayette de Jean Dréville » composed by Stève Laurent and Pierre Duclos, Ref : Medium 432 741 BE, Philips, 1961, France . EP / 45 T - Marches Triomphales du Film « La Fayette », Ref : 72474 Barclay, Raymond Lefèvre with his Orchestra, 1961, France. 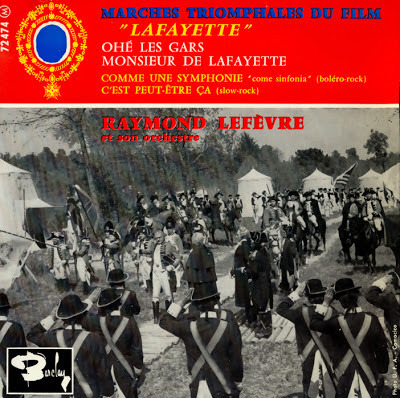 LP / 33 T - « La Fayette » Livre Disque Atlas ; Ref : A 30 1039, Michel Le Royer and les comédiens de la Compagnie des deux-masques, Music by L. Dupont-Becker conducted l’orchestre des concerts Pasdeloup, 1961, France. NB : My appreciation for his friendly help to Jean-Pierre P.